Following the Fukushima nuclear disaster in 2011, safety regulations at many nuclear plants have been considerably tightened, this has led to an increased demand for fire fighting pump systems. These systems must comply with extremely strict requirements and regulations. 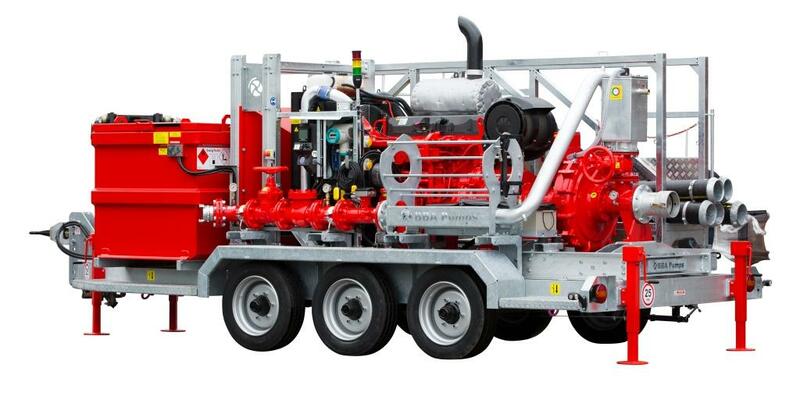 Working closely together with the Belgian distributor Rental Pumps, BBA Pumps has recently completed one of the most demanding projects in its history – the delivery of nine mobile disaster relief pumping systems. These pumps are supplied to provide an extra level of safety in a large nuclear power plant. The high pressure pump units are not only meant to fight fire – their main goal is to prevent a meltdown in a worst case scenario. In the event of a total black out, the pumps will be deployed to pump cooling water into the primary circuit of the reactor as a last resort. They can even be used to supply a boric acid solution in order to shut down the nuclear reaction completely. * The pumping systems had to pass a SQUG test for seismic activities. * Four pumping systems, equipped with a high head pump type BA80H D275, powered by a Perkins four cylinder diesel engine, type 404D-22T. This pump supplies a pressure of up to 9 bar / 130 PSI and a flow of 130 m3/h / 572 US GPM. * Five larger pumping sets with a high pressure pump, type BA-C150H41, powered by a Volvo Penta, type TAD952VE, with a power output of 234 kW / 318 Hp and an operating point of 20 bar/290 PSI at 130m3/h/572 US GPM. How can power generation companies protect themselves from loss?